The day starts out with the news that there’s a dead horse in Pete Lake. Every year a horse dies somewhere in the backcountry, and the details are usually hazy. The information filters in second- or third-hand. No one comes forward to claim responsibility and we are left a 1200 pound carcass for the rest of the summer. John calls in from the field. He’s seen it and there’s nothing we can do for now. We had planned to hike to Waptus Lake via Waptus Pass, which meant taking a right turn at Pete Lake. So we missed the dead horse in favor of climbing a thousand feet in less than two miles on a steep rocky exposed slope. The day started out warm and we sweated our way up the switchbacks. Once we got on top there were six small trees to cut out of the trail which we accomplished easily. Snow was still melting, creating bogs in the trail which never seem to completely dry up. The mosquitoes were just starting to appear–Waptus Pass is swampy and the little whiners thrive there until sometime in August. We sailed through the green meadows to the large white pine snag waiting for us just on the other side. One of the old silver giants fell across the trail, its dry limbs the diameter of pole-sized trees. We are finding the dead wood to be extra dry this year and it took forever for our saws to chew through the limbs then the main trunk. Back and forth with the crosscut saw, with fine sawdust dribbling out of the kerf. There were three of us, so we took turns when one of the two sawyers grew tired. The resting person crawled into the shade to drink water and rally for their next turn. We finally got the log cut and then the chunk dropped down, caught and stuck. Cursing ensued, then chopping with the ax to remove the wood that was bound. One person heaved on a pole while the other two pushed with their legs and at last the chunk shifted and rolled out of the trail. Finally! The trail was clear to the lake. We swung our packs onto shoulders and prepared for the 3.8 mile hike to camp. At least it was mostly downhill. Years ago someone on the trail crew coined the term “zombie hiking” for that state you get into when you’re tired but you have to keep going. You become the walking dead, capable of communicating only in monosyllabic grunts. Rational thought really isn’t an option at this point, because most thoughts disappear until you get someplace where you can stop and rest. As a zombie hiker, my strategy is to submit to whatever earworm is playing in my head and let the lines of some song repeat endlessly along with the rhythm of my feet. Sometimes I find a stick and flick twigs out of the trail while I hike. My main goal is to avoid tripping and falling down. Once you get used to it, zombie hiking is kind of pleasant. We reached the Waptus River ford and stopped to zip off pant legs and put on wading shoes. Boots tied together and slung over my pack, I waded into the cool water with the crosscut saw in my hand. Behind me I could hear Jon’s falsetto singing a 1970s commercial ditty about short shorts. Dang, I remember that one, and would have been happy to let it lie forgotten in the recesses of memory. Oh well. I sloshed into camp in my wet shoes and soggy pants. John was there, having met the packstring and opened the manties to pull out camp gear. He had the stove set up and water boiling. It was 8 PM and still full daylight. “Welcome home,” said John with a smile, and we grinned back. Everyone feels the effects of the previous day. Less hiking is in order, so it’s decided that two of us will log out the trail along the lakeshore while the other two go up to the Pacific Crest Trail and work south. Brent and I go to the lakeshore, stopping at the big campsite to gaze up the lake toward Bear’s Breast and Summit Chief. 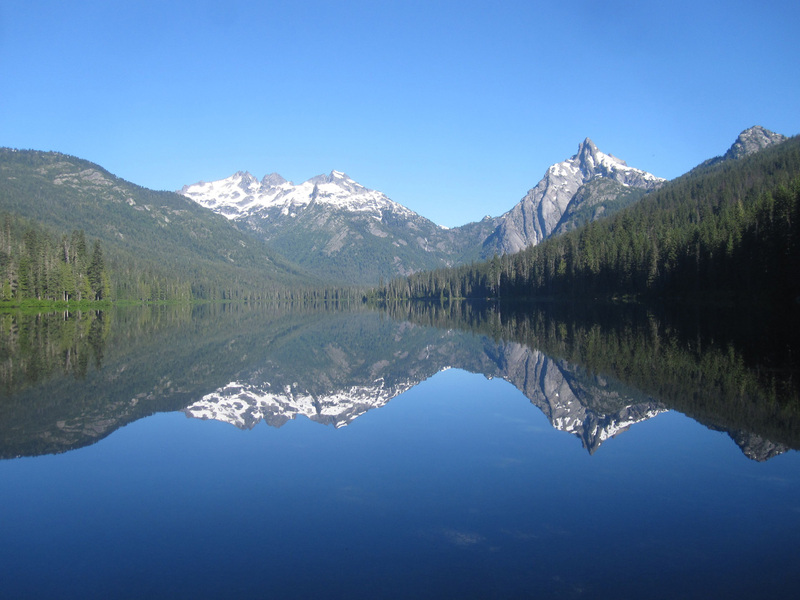 The water is still, reflecting the broad glacial valley and peaks. “It doesn’t get better than this,” he remarks. Yup. We work slowly and steadily, cutting log after log. Over our heads in the green conifer canopy, thrush melodies loop around the branches and echo in the warm humid air. At lunchtime we seek deep shade and rest there until it’s time to get up and go again. My thoughts are looping like the thrush songs. Part of my mind wants to go over and over how strange it is to be in my mid-fifties, still doing trailwork. As if there is something suspect about a woman who chooses this, something infantile about not moving into middle management. Most people my age work in a cubicle in front of a computer screen. I have that too, but I see it as a necessary evil. When priorities shift to fieldwork I have no problem walking out the office door to pick up the ax and saw. It’s possible that my choice to do physical hands-on work is brilliant. I’ve found the place where I am most effective. I’m an artist by inclination and training. Years of practice have sharpened my critical thinking skills. The process starts with observation, seeing the problem to be solved. Judgment is suspended while options are explored and evaluated. Both sides of the brain are engaged–the right side intuits the whole, the left side analyzes and breaks the situation into chunks. There is an element of collaboration as well, with the coworker(s) contributing their own perceptions and ideas. When it’s time to execute the plan, my hands are familiar with tools and the manipulation of materials on hand to solve the problem. As a painter, I know that I have to continually respond to what unfolds on the paper in front of me. Changes transpire and my expectations are not always met. It’s the same in the woods as it is in the studio, so I’ve learned to not become too attached to my expectations. It’s impossible to read the all the forces at work on a log lying across the trail, and that’s what keeps the job interesting. The day grows breathlessly hot, even in the shade. Thirst scratches at my throat, and I want to lie down for a nap. We find water in a brushy draw and filter into all of our containers. After a break, we find half of a large spruce tree lying down the trail. There is no place to cut it where we can move the sawed-off segments. We’re in the infamous Snag Patch, and the ground is covered with logs we’ve cut over the years. Scratching our heads, we thrash through the waist-high thimbleberry brush looking for an alternate location. Word comes over the radio to head back to camp a little earlier. Jon and John are 20 minutes behind us and will have a look at the situation. No arguments from us. Back the way we came. Afternoon wind raises a chop on the lake, and waves glitter in the sun. I like the sound of waves lap-lapping the shore, so different from the ubiquitous running water heard in the Cascades. We get word that the local outfitter has used a couple of his draft mules and a block and tackle to pull the dead horse out of Pete Lake a couple hundred feet above the trail. It’s not the end of the saga, but it’s a little better for now. We all have a private dip in Spinola Creek to wash away the sweat and share a pasta meal cooked by me. The boys do the dishes. Nighthawks appear overhead to hunt for abundant mosquitoes and put on a show of aerial acrobatics, complete with buzzing calls and roaring feathers as they turn and wheel above the lodgepole pines. A nearly full moon glides up over Polallie Ridge and we are done for the day. Today’s plan involves some distance. Jon and John will construct the relocation in the Snag Patch while Brent and I cruise ahead on the Crest Trail. Logout is the priority. We linger at the Spade Creek bridge to filter water and revel in the coolness where water thunders down. It’s as if the creek exhales the breath of snowmelt here. We find two small logs to cut between there and the upper Waptus River bridge. We are right under Bear’s Breast, and looking up I can see the curved striations in the rock. Sediments laid down eons ago when the continents were shaped differently smashed into the North American plate and were pushed up to form the Cascade Range. The mountains are still rising. Evidence of geolological time is all around us. We linger on a glacier-rounded fin of rock above the campsite where trail crews have stayed before. I have a memory of lying up on that rock during an unsettled time in my life, feeling the heat of the day radiating upward. My inner turmoil seemed to rise up with it, and as I watched the stars prick the not-quite-dark sky I came to a decision. I had come to a fork in the trail and my direction was now clear. Sometimes it takes a long hike into the wilderness to be able to reach a place quiet enough to hear what your soul is telling you. I intend to remember that lesson. We hiked on and took a right turn onto the Dutchmiller Gap Trail. I felt a tingle of excitement. I hadn’t been on this trail in many years and remembered almost nothing about it. We had to cross Chief Creek on a log jam then bash through the brush back to the trail. There was mountain goat fur clinging to the alder branches. We cut a log and ate lunch in the shade. Then moved on. The trail began climbing and I knew there was a series of switchbacks up through a dry forest and up an exposed ridge before reaching the subalpine zone. Brent was motivated to go all the way to Lake Ivanhoe. He’s a young guy, the age I was when I started doing trailwork in the 90s. Me–I was just happy to be where I was, rediscovering the trail and terrain. I was impressed with the number of healthy western white pines so close to the crest. White pine blister rust (an imported fungal disease) decimated white pines in the Northwest around the turn of the 20th century, but these somehow escaped or rebounded. When I ran out of drinking water I turned back after talking to Brent on the radio. He was going for it. I retraced my steps down the switchbacks to the Waptus River where I filtered a supply for the hike back. By this time, all four of us were hiking solo and we checked in over the radio. It was hot but spirits were good. I zombie hiked the three and a half miles to camp, waiting for the passage of the cold front. Wanted to see how hard the wind would blow through the Gap and down the valley. It didn’t materialize. No wind, no clouds. 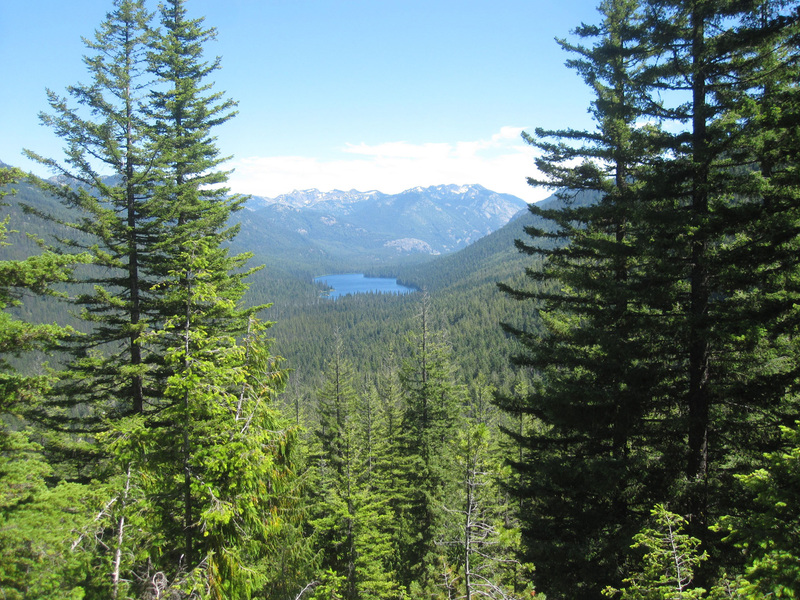 The mission of the day is the Pacific Crest Trail north to Deep Lake, four miles. Brent and John leave camp at 6:30 to scout ahead and report back. By the time Jon and I are ready to follow, John has radioed back that they’ve come across an avalanche path with 70 trees across the trail. Bring the double-bit ax and the long crosscut saw. He’s certain that we will not be able to finish the clearing in one day and will have to make another trip. I had thought to put on a clean shirt, but knowing that the logs would be pitchy I pull on the soggy dirty one I’d worn the previous three days. I grab all the spare wedges in camp and stuff them into my pack and we head out. I’ve always liked the climb up the Spinola Creek Trail (named by Spanish-speaking sheepherders) for the gorge off to the right where the creek roars down in a series of waterfalls. And the especially sentient-seeming old-growth stand along there. I have no logical reason to suspect those venerable hemlocks and firs of awareness and intelligence. Perhaps it is the thirst and hunger and fatigue that comes on after four days of heat and hard work that lowers my rationality. Somehow I know that they feel the vibrations of my footsteps through their network of roots. Perhaps the open stomata on the bottoms of their millions of needles take in the carbon dioxide I exhale even as I inhale the oxygen they respirate as a result of photosynthesis. Perhaps they know I mean them no harm, that I have deep respect for them. Near the junction with the PCT, I pause to lean my forehead against the furrowed corky bark of a Douglas-fir and take a few breaths. Communion, I don’t know. It’s Day Four and I operate on instinct. Trees are incredible beings and I would be remiss in not acknowledging that. Once on the PCT, I pass through the first avalanche chute and the second. As I approach the third, there is light through the trees that has never been there before. This is it. Coming closer, I see a tangle of limbs and silver fir trunks. We have decided to be professional on the radio today. So Delta Force One calls Delta Force Two to advise that they are on scene and is there a plan of attack. Force One is on the north side of the avalanche and says to start hacking and we’ll meet in the middle if we have anything more to say to each other. Roger, copy that. Once again the sun beats down relentlessly. Jon and I each tackle a pile of logs, close enough that we can call to each other for assistance or to swap tools. As I buck small trees, I put aside pole lengths that we can use for levers or skids. To the north through the debris, I can hear a single-bit ax hammering a wedge into a saw kerf. So I know the guys are not too far away. I find myself pausing to catch my breath in the shade of a single tree. Sweat runs into my eyes. I cannot drink enough to stay ahead of the thirst. This job is about endurance. And it’s good to have a very clear mission: get the trail open. Lunch is a little longer than usual. We have found deep shade under tall western hemlocks above Spinola Creek. Water is filtered and drunk and we recline on the bed of needles. We talk about the anniversary of the fatalities at the Thirtymile Fire–July 10, 2001. The trail crew was at Waptus then too. Our alumna Kim hiked in to break the news to us. We reminisce–how much has changed and not changed since then. Finally someone mutters “Well…” and we get up. Back at it. We single buck, we double buck. We are in a rhythm, hardly speaking. I am gratified to see the long wood shavings coming out with each stroke of the saw. The teeth have been filed and set to power through green wood, which is reassuring after the tedium of sawing through dry snags. 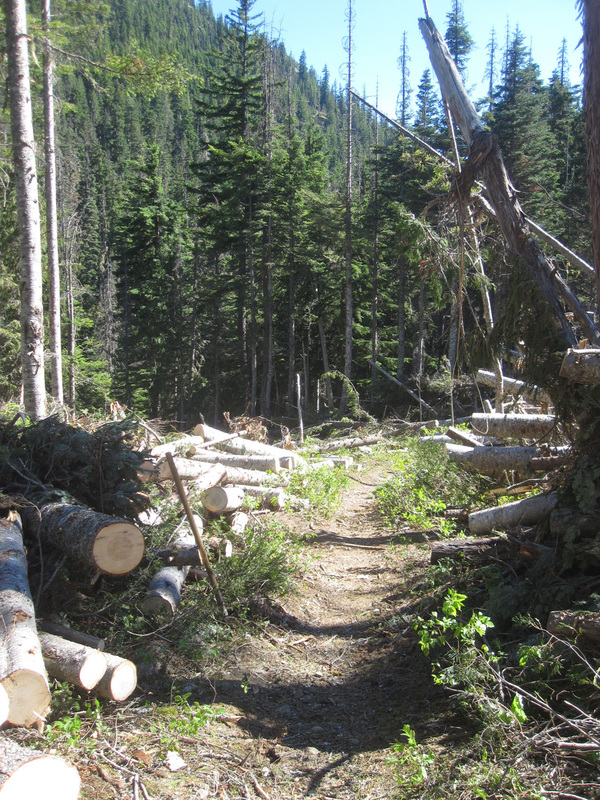 One by one, logs are severed and levered off the trail. Progress. A couple of backpackers come down from Deep Lake and stop to watch us. They have stories about their travels and questions about what we’re doing. We pick their brains about what lies ahead for us. Oh there are lots of logs, they say. No more avalanches. We are down to six logs then four. John and Brent tackle two standing trees that lean over the trail. Jon is gnawing away at a silver fir with an attached rootwad and interesting bind. We take turns single bucking. Then we’re done. The trail is clear. High fives all around. We’re dirty and covered with pitch. Hot and tired but we accomplished the mission. Just like we knew what we were doing or something. It’s pack up and go home day. Gonna be a scorcher. Smoke filters in from somewhere. During our morning check-in, John and I are asked if we are interested in going to Entiat as resource advisors on a non-wilderness fire. Hm, let’s see. It’s Day Five for me, Day Eight for John. We’re out of food and clean laundry. And Entiat is hotter and steeper than here, and has a history of large scary fires. Nope, not interested. There will be other opportunities. John and Brent pack their things and head out over Waptus Pass and Polallie Ridge. Jon and I finish packing up camp and divide the gear into loads for the packer who is coming in with mules. Then we cross the river one last time–thigh-high cold water. We meet Lance and the packstring a mile downriver, visit briefly and keep going. By noon it’s so hot that the birds have gone silent. Mosquitoes have chased us over Cone Mountain and we are glad to get away from them. We stop tossing rocks out of the trail and talk with the few backpackers who are coming in for the weekend. Time to make tracks down the dusty trail. Somehow the miles pass underfoot. Jon thinks it’s about 90º. Our hands are swollen from hanging at our sides. We learn later that the capillaries open to dissipate heat, using the surface area of the skin. We may be slightly delirious, but we keep going. Then we are at the end of the trail. There is the truck waiting for us, with the air conditioning cranked up. The dashboard thermometer reads 94º. How strange to sit down on an upholstered seat. And move forward without moving a muscle. We drink water, and converse. Some of us are crankier than others about being back in civilization. We pass campers and RVs and vehicles loaded with bicycles and kayaks. At the ranger station we unload gear, put tools away, go in the office to download information and hear what’s happened while we were out. Later the packstring will arrive with more gear. Then we’ll go home for foot and showers and rest. Another Waptus Trip is history. Ah yes. I do miss those days, weeks, months, years in the woods. Felt as if I was right there with you. Nice details Deb. Have a good field season. And thanks for the seeds!